Discription:This is very tasty pickle.Try it and Enjoy!!!!!!!! Take cauliflower and make it into small pieces. Heat a pan and dry fry mustard seeds litely and grind them in a dry container. In the same pan dry fry fenugreek seeds and grind them . Now heat a kadai add oil , when it is heated add cumin seeds and mustard seeds . Next add garlic pods , asafoetida little , curry leaves. Now add chopped & dried cauliflower pieces and fry for 5 mins (till half done ) and switchoff the stove. When it is cooled add salt , chillypowder , turmeric , mustard powder and fenugreek powder. Now squeeze lime juice of 1 & 1/2 big lemon . mix well and put pickle in a dry box. 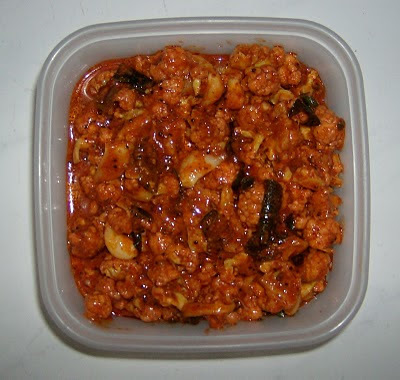 Tasty cauliflower pickle is ready to serve with rice and a dollop of ghee. If u want cauliflower to be crunchy dont fry them.this is not compulsory. store this pickle in fridge . Serve pickle only after 1 complete day. This pickle will be good for 1 week. U can do this pickle with or without using garlic pods . Both give different taste. so try both the versions.